The list of veggies that I've grown in pots in my rooftop garden has been ever increasing. 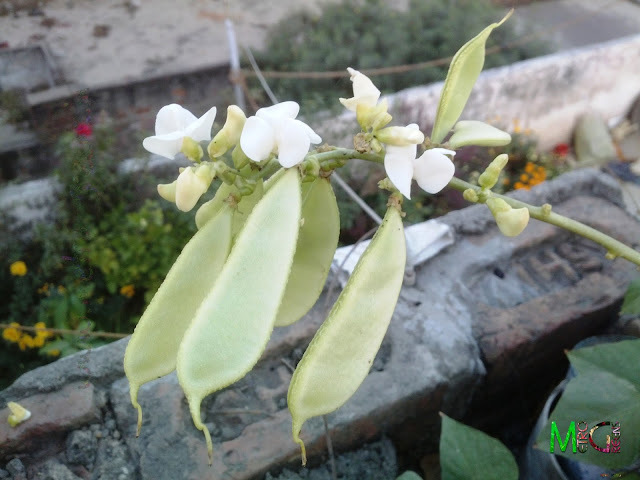 This time around, it's a vine of broad beans (Phaseolus lunatus), also known as lima beans, or butterbeans, elsewhere in the world, that's been flourishing, blooming and is now bearing fruits. I've been postponing posting about this for quite some time now, as I wanted to share this one in full glory, with blooms, as well as beans. 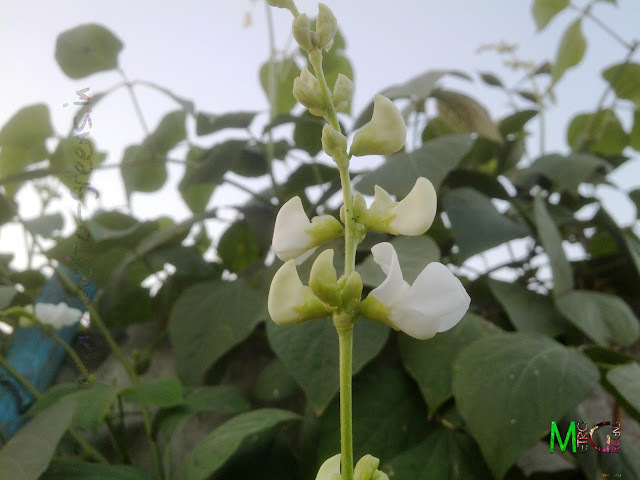 This vine too was planted by my mother, who craves for such beans, while I do not like having these in my plate. 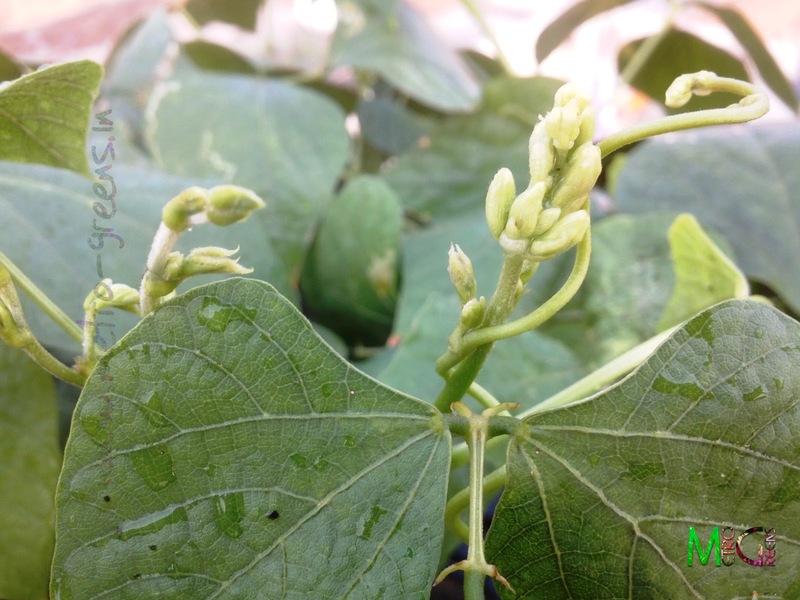 But, once the vine take a shape, it gets included in my rooftop garden. Anyways, coming back to the topic, this vine was sown around two months back, and it climbed up along with vines of the pumpkin, and the velvet beans. 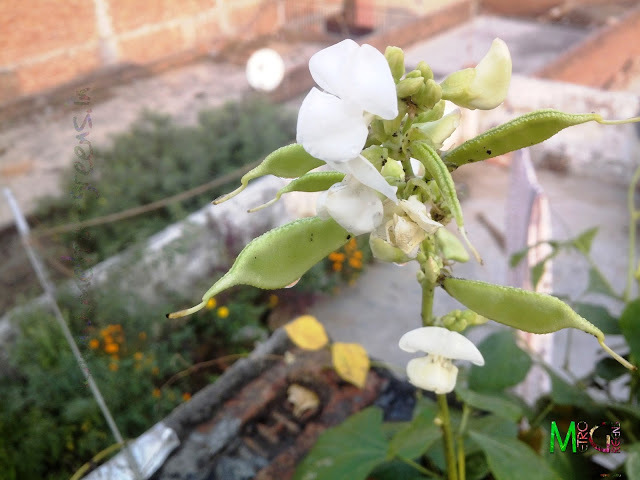 While both of those are history now, as a result of two careless applications of Urea (NPK), a chemical fertilizer, I bought more than 2 years ago, at a time when I was starting my rooftop garden. My dad, who, overwhelmed by the small pumpkin in the vine, applied the fertilizer, two times, within a very short span of time of less than a week, in a number of plants, including the pumpkin, the velvet beans, the rangoon creeper (madhumalati), and my pomegranate plant, and a few others, I think, which somehow survived the side effects of it, but these four, including a chilly plant, and my lone curry leaves plant were the worst affected, and which caused all these plants to burn, killing the pumpkin, velvet beans vine and the chilly plant completely. In other affected plants, including the rangoon creeper, pomegranate and the curry leaves plant, the rangoon creeper and the pomegranate have also dried up, all the leaves have dried. I still have high hopes for both these plants, while the curry leaves plant, it seems wasn't that badly affected, still has green leaves in it, though, the lustre of fresh curry leaves and the shine is missing in this one too. Seems, like, I've drifted away too much from the topic of the broad beans vine. So, getting back to the topic, I'll be sharing the photos now. The sight of the buds was convincing for me at that time. The sight of the first bloom, satisfies a gardener, to the extent that he feels all his hard work has paid, even before actually having the fruits of his hard work. 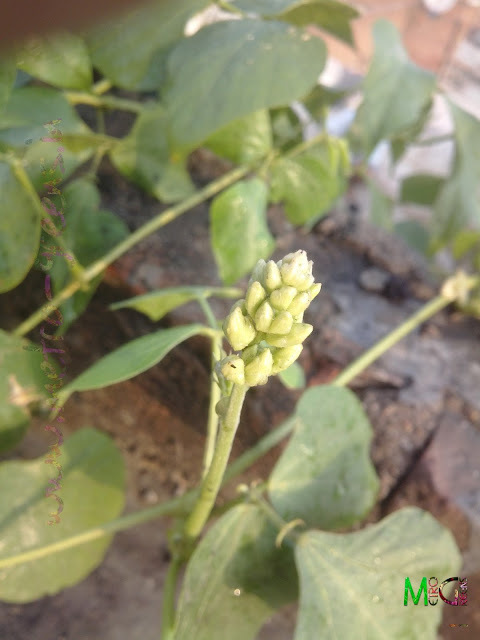 The same way, these buds too satisfied me, to the extent that I have successfully grown a vegetable vine, even though, I won't be the first one to like having it's vegetable on my plate. As though, it wasn't enough, the aphids were there on all the buds. All the stocks were very heavily infested with those black six legged creatures, a few of which had wings. I resorted to a method of dealing with these, which is usually used in the rural areas by farmers. Since I belong to farmers family, my mother suggested me to use ashes from burned cowdung cakes, that would, if sprinkled upon the leaves and blooms of the broad beans vine, would help get rid of these aphids, and I did that too, but, unfortunately, it failed. So, I had to resort to the last remaining way, using a chemical insecticide, called Malathion, which is known to lose its toxicity over a period of time. 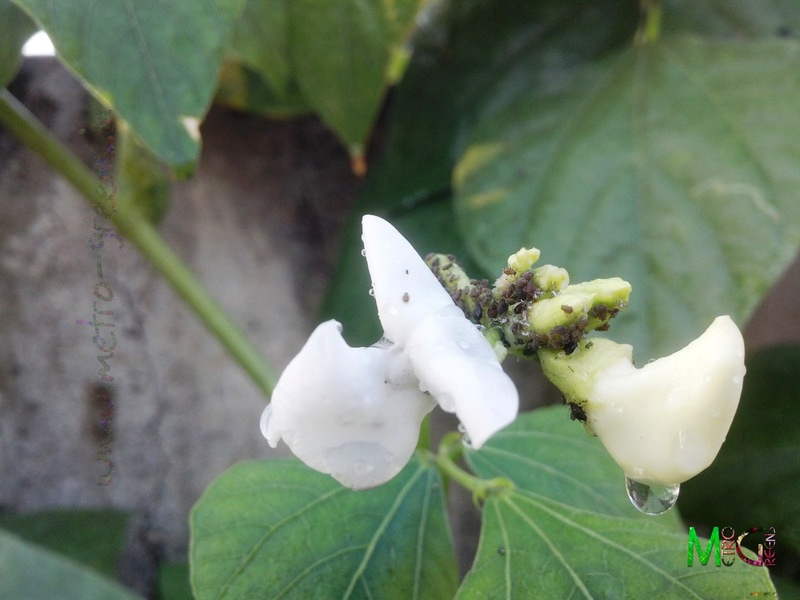 I sprayed the insecticide over the vine using my hand sprayer, and within a couple of days, the aphids were gone, and it looks like my broad beans vine is healthy for now, and looking at the number of buds and white blooms, I'm expecting a good yield from this. A healthy looking shoot with some good looking buds and white blooms. Looks promising, isn't it? Some developed broad beans fruits. Though these are pretty young, I can harvest them anytime within a week or so from now. Some developed broad beans fruits. Though these are pretty young for now, I can harvest them anytime within a week or so from now. I think I can leave you all now for the time being. I'll be back with new gardening adventures featuring the chrysanthemums in the upcoming posts, that have now taken over the task of beautifying my garden. Till then, keep visiting and HAPPY GARDENING!